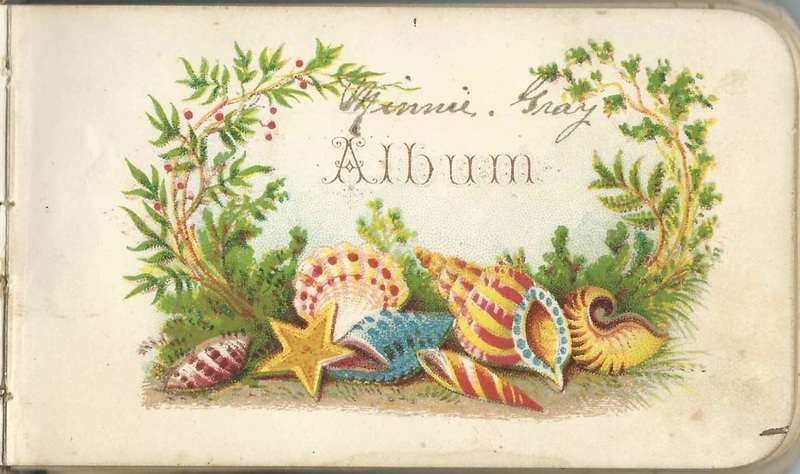 1880s-1904 autograph album that belonged to Minnie Bell Gray of Morgan Center, Vermont, and/or Beebe Plain, Vermont. When the final border between Vermont and Quebec was set, it split the community of Beebe Plain in two. Some of the inscribers in Minnie's album hailed from Beebe Plain, Vermont, now a village in the town of Derby. Even more inscribers hailed from Beebe Plain, Quebec, now a village in the town of Stanstead. Minnie wrote her name on the title page. According to a record in Vermont Vital Records, 1720-1908, Minnie Bell Gray was born September 28, 1867 at Morgan, Vermont, the daughter of J. A. Gray and Abbie C. Gray. They were Joseph A. Gray and Abigail Caroline (Bartlett) Gray. 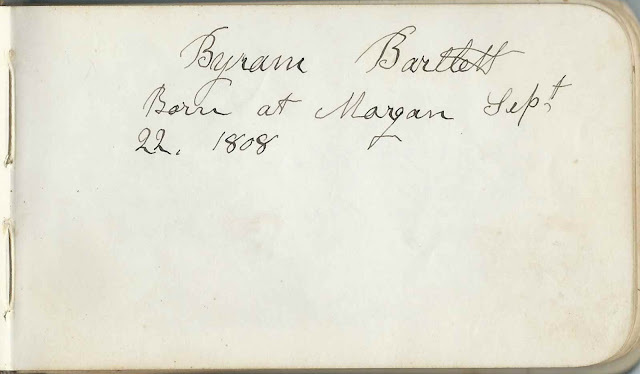 Minnie's maternal grandfather, Byram Bartlett, inscribed the page below and gave his date and place of birth as September 22, 1808 at Morgan, Vermont. Several other people with the surnames Bartlett and Gray inscribed pages and were presumably Minnie's relatives - see the alphabetical list of inscribers at the end of this post. On March 24, 1885 at Morgan, Vermont, Minnie Bell Gray married Calais, Maine, native Joseph H. Gilmore [shown as Joseph A. on their marriage record], son of John and Ellen Gilmore. Joseph, who gave his address as Lewiston, Maine, inscribed a page in Minnie's album on April 13, 1882 at Morgan Centre, Vermont. Minnie and Joseph died in 1940. They're buried in the Center Cemetery at Morgan, Vermont, along with their children and other relatives. Bird design with the words "To Minnie" incorporated in it. Unsigned; perhaps done by the inscriber of the left facing page: Nellie M. Hutson or Nellie M. Huntoon. Clarissa Bartlett of Morgan Center, Vermont; inscribed on March 10, 1881 at age 72. Clarissa (Bryant) Bartlett, maternal grandmother of album owner Minnie Bell Gray. Byram Bartlett, "Born at Morgan Sept 22 1808". Maternal grandfather of album owner Minnie Bell Gray. Amos Bigelow, "Born April 2nd 1817 Conway Mass". Shared the page with Mary Ann Bigelow of Beebe Plain, Quebec. Mary Ann Bigelow of Beebe Plain, Quebec, inscribed March 9, 1882. Shared the page with Amos Bigelow. R. P. Buzzell of Beebe Plain, Quebec; inscribed on "2/3/82"
D. L. Carter of Beebe Plain, Quebec. "No 2. B. P. A", presumably Beebe Plain Academy. "Christian St."
Minnie S. Fogg of Beebe Plain, Quebec; inscribed on March 14, 1882. "Map Drawing", presumably a class she and the album owner Minnie had together. Minnie Gray of Beebe Plain, Vermont and/or Beebe Plain, Quebe,; a village straddling the border. 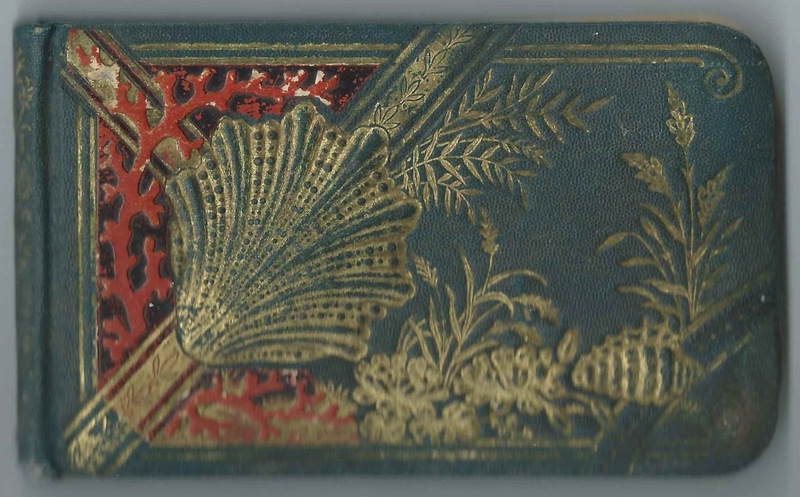 Album owner; she wrote her name on the title page. Bunney Gray of Morgan Center, Vermont; inscribed on December 7, 1884. "Your Brother". Possibly Joseph B. Gray. Mary F. Gray of Morgan Centre, Vermont. She wrote her name in such an elaborate font that I;m not sure of her middle initial or surname. Minnie House of Beebe Plain, Vermont; inscribed on February 6, 1882. "don't - flirt - Minnie"
Nellie M. ? of Island Pond, Vermont; inscribed at Morgan Center, Vermont, on April 14, 1882. Her name could be Nellie M. Hutson or Nellie M. Huntoon. Ida M. Reed of Beebe Plain, Quebec; inscribed on April 11, 1881. "Skating with H. A. F." [not sure of middle initial] "Sliding with M. J. V."